That's this live text finished now. Thanks for joining us. Head over to our general live text commentary for reaction and updates from all the 15:00 BST games. The pain is over. Nine-man Newcastle lost their eighth game in a row. Leicester have won four out of five to close the gap on the Magpies to a point. Can it get any worse for Newcastle? Of course it can as Daryl Janmaat is shown a second yellow card for fouling Jamie Vardy - they will end this game with nine men. And they will be without two of their first-choice defenders for the next game. Siem de Jong has a shot for Newcastle but tipped around the post by Kasper Schmeichel. Jamie Vardy comes back on after discussions with boss Nigel Pearson. His knock must not have been too bad. Jamie Vardy is limping off the field. Leicester have no substitutions left to make but if he's injured they surely won't risk him for the final few minutes. This game is just drifting towards its inevitable conclusion here. Both managers would probably be happy to hear the final whistle. Anthony Wood: From top to bottom, Newcastle United is a club in disarray. Heart and soul of the football club slowly withering away. Anthony Shaw: Newcastle are in meltdown! Might do them some good to get relegated actually so they can rebuild. Dreadful! Newcastle defender Paul Dummett, returning from injury today, was booked earlier and ran the risk of letting his team go down to nine men when he held onto Jamie Vardy. "Leicester are a team transformed, they are playing with confidence, poise and panache. There is a lovely feel good factor around the stadium. It was the perfect time for them to play Newcastle." No hat-trick for Leonardo Ulloa as the striker comes off for Andrej Kramaric. By this stage I could come on and Leicester would still win. "Newcastle look a very beaten and downcast side. Two instances in the game sum them up, the first is Mike Williamson's ridiculous second challenge that got him sent off. "The second is halfway through the second half where Fabricio Coloccini got a knock in his own penalty area and stayed down holding his leg but gets up when the ball goes out of play. Your team are defending for your life, you can't stay down injured." Dean Hammond's first touch of the ball since January is to blaze a shot well over the crossbar. Leicester make a change as veteran midfielder Esteban Cambiasso comes off to a great reception and is replaced by the slightly less celebrated Dean Hammond. Newcastle make a switch, Ayoze Perez is replaced by England Under-18 international Adam Armstrong. Free-kick to Newcastle as Wes Morgan fouls Ayoze Perez on the edge of the box... But Jack Colback's free-kick is straight at Leicester keeper Kasper Schmeichel. Tom Lowe: Newcastle need to spend £50m in the summer, more like a £100m investment. That squad is horrific. It'll never happen. David Ljunggren: I've watched Newcastle for 30 years and of all the lows I've seen, this must be the worst. Going down might help us rebuild. Leicester City - who continue to have the best of the attacking play - make a change in defence as Ritchie De Laet comes on for Marcin Wasilewski. Newcastle make a change, Vurnon Anita comes on for striker Emmanuel Riviere and goes into defence. It's hard to see any way the Magpies could come back into this. Newcastle United are down to 10. Defender Mike Williamson absolutely clatters Jamie Vardy down by the side of the pitch near the cameras and advertising hoardings. A second yellow card - he's off. I didn't see what happened initially as the camera we were watching from is the one Vardy was bashed into! Leonardo Ulloa almost has his hat-trick but his header from Riyad Mahrez's cross is well saved by Tim Krul. It looked like it was going to be a goal - in fact BBC World Service's John Bennett, who is sat near me, almost leapt out of his seat to celebrate 4-0! Newcastle boss John Carver makes a change and striker Siem de Jong, who has missed most of the season with a thigh injury, who replaces midfielder Ryan Taylor. De Jong scored in their last game, a 3-2 defeat by Swansea, in his first game since March. Three strikers on the pitch now for the Magpies - with seven Premier League goals in their combined careers. Leonardo Ulloa, a summer signing from Brighton, has scored the same amount of Premier League goals this season (10) as Robin van Persie and Wilfried Bony. Jamie Vardy forces another save from Tim Krul after being played in by Leonardo Ulloa. Marc Alrighton has a follow-up chance deflected out for a corner. Emma Gregory: Wow, some half time team talk that was. Embarrassing to be a Newcastle fan. Please sell up Mr Ashley. I'll give you a tenner. Felix Thompson: Newcastle attempting to concede from every set -piece on the menu, Leicester have got their just deserts. Newcastle defender Mike Williamson booked for fouling Riyad Mahrez - the Magpies are all over the place. It's almost 4-0 as Esteban Cambiasso plays in Jeff Schlupp, who crosses to Marc Alrighton. The winger has provided two assists in a Premier League game for the first time today but this time he decides to go for glory himself and fires wide of the far post. relegation piece on the BBC Sport website, Newcastle's main hope of staying up is for the teams below them to keep dropping points. Hard to see the Magpies themselves up. "I'm absolutely delighted for Nigel Pearson after he week he has had, it is a wonderful result. Say the game is finished, all over wonderful start again from Leicester City but you could say the goals have all come from Newcastle's own making." That really was terribly stupid by Emmanuel Riviere, although it's the kind of thing that usually doesn't get penalised. Zero goals in 20 Premier League appearances and now that - not the signing of the summer. Newcastle keeper Tim Krul goes the right way but Leonardo Ulloa's penalty is excellent and into the top corner. A rout. The corner comes in and Emmanuel Riviere shoves Marcin Wasilewski in the back. Penalty! Leicester immediately get a free-kick but have already spent more than 38 seconds to take it. They were leading by this stage of the first half. Set-piece comes to nothing. Second half under way - no changes for either side. Players are back out for the second half. Wonder how angry John Carver has been with his Newcastle players. Huge noise for the Foxes players after that first-half showing. Fikayo sobowale: Is it not obvious that Newcastle want to set a new record for consecutive losses in the Premier League. Adrian metcalf: If Newcastle go down Carver will have to go down as worst interim in history? Surely! "Leicester came out of the blocks and got after Newcastle. They got themselves in front and turned over another quick goal on 16 minutes. "Newcastle then came into the game and showed touches but they are lacking that real confidence to get hold of the game and they need to score quickly into the second half or the game will get away from them." "A standing ovation from the home crowd. It was a whirlwind start and Leicester led 2-0 with 17 minutes gone. "Newcastle were rocked back on their heels. They have at least settled into the game and seen more of the ball but haven't found a way back into the game yet. It was Leicester's half." "The next goal is vital before half-time. Newcastle have had the better chances. On chances alone it has been five a piece but Newcastle have had the better opportunities. But they have failed to defend two set-pieces. If Newcastle can get one back before half-time it changes the dynamics in the stadium and the game." Jonas Gutierrez has probably been Newcastle's most active player this half, he fires another shot just wide from outside the box. James Richardson: We are losing to a team managed by a man who recently called a journalist an ostrich. How should I feel about this? As I say that Leicester attack and midfielder Matty James fires a ball across the box - which Esteban Cambiasso tries to head it. It might have been a shot. This is one of Newcastle's best chances as Ayoze Perez pulls it across to Ryan Taylor, who takes a first-time shot from 25 yards. However it's saved by Kasper Schmeichel and Esteban Cambiasso hoofs it clear. Newcastle win a corner as Jonas Gutierrez's wild shot is deflected wide. And Newcastle fans, having waved white paper before the game, are now holding up red cards in protest at Mike Ashley's running of the club. "There is a real lack of confidence in Newcastle's play. They have not got any real belief to go and win this game unlike Leicester who look like a team playing on the back of winning four out of their last five games." If anything sums up a player's career at a club, it's this. Ayoze Perez finds Newcastle strike partner Emmanuel Riviere and just when it looks like the Frenchman might finally get his first Premier League goal he loses his footing and kicks the air. Newcastle's players have actually been the more attacking-minded so far despite the scoreline. These are the average positions so far. Leicester have midfielder Matty King shown a yellow card for a sliding tackle on Jonas Gutierrez. The referee played advantage, which led to a Magpies corner, but came back to book the Foxes player. "There has been a really good pace to the game which has stemmed from the first 40 seconds from the goal. It is important for Leicester that Esteban Cambiasso and Matty James sit in the midfield zone in front of the back three and shield them from the front three of Newcastle." 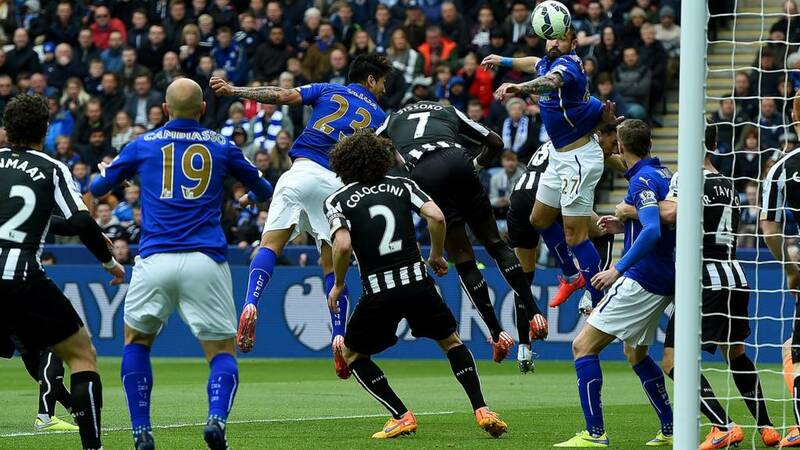 Newcastle midfielder Jonas Gutierrez is booked for fouling Leicester veteran Esteban Cambiasso. For once the set-piece comes to nothing. Newcastle have won none of the last 103 Premier League games in which they've trailed by two or more goals. With a striker force who have a combined career total of six Premier League goals, you wouldn't fancy this is the day that changes. MixItNFixItMan: Energised LCFC vs. NUFC so far, incredible that earlier in the season there was 17 point between them! The great escape! Uday Tumuluri: Newcastle making Leicester look like Barca now. Can we end the season like right now?! Newcastle striker Emmanuel Riviere hasn't scored in his 20 Premier League games (including today) but at least he has a chance here, controlling the ball with his back to goal on the edge of the box and hitting the sidenetting. It's hard to imagine how John Carver could have done a worse job with Newcastle. This would be 12 defeats in 16 games with a team who have plenty of international players. Eight of Leicester's Premier League goals have come from defenders this season. Only Chelsea and Everton (9) have more. As things stand, Leicester are four points above the relegation zone and only one below Newcastle. Sunderland, in 18th, who play Southampton today, will have two games in hand on both including this afternoon's match. "Two Leicester players bearing down on goal and the Newcastle runners left them. Morgan was second in line and got the touch on it. Newcastle have conceded on two set plays which points to a lack of confidence and certainly a lack of leadership." Oh my. Marc Albrighton's free-kick is whipped in, Leonard Ulloa can't quite get his leg to it... but Wes Morgan who is just behind him can. The big Foxes defender turns the ball past keeper Tim Krul. Leicester defender Jeff Schlupp picks the ball up in his own half and goes for a dribble. He knocks the ball past Newcastle full-back Daryl Janmaat, who brings him down. Yellow card. Newcastle's defensive line is ridiculously high. Marc Alrighton plays in Jamie Vardy who for a moment looks like he might be the only outfield player in Newcastle's half, but luckily for the Magpies Vardy can't speed away and he's caught by a defender. Newcastle striker Ayoze Perez pulls off a fantastic first touch to take himself past Jeff Schlupp but the Ghanaian defender and Wes Morgan combine to get the ball out of play. Newcastle's defence are all over the place. First goalkeeper Tim Krul has to rush out of his box to head the ball clear after Marc Albrighton played the ball forward to Jamie Vardy. And then moments later striker Vardy forces a save from the keeper. David Meacock: Newcastle United defence doing a great impression of ostriches for Nigel Pearson's side. Paul Christie: Ulloa rising like an Ostrich! "I think there are seven teams involved in the relegation scrap and, looking at the table, 35 points should be enough to stay up. "That is good news for Newcastle because, despite their terrible form, they have that many already. "By my reckoning, a point would make absolutely certain of safety for the Magpies - but at the moment it is hard to know where that would come from. "Newcastle's top-scorer Papiss Cisse will return from suspension after this weekend's game against fellow strugglers Leicester. "They have to hope the Senegal international can make a difference because I have seen nothing else recently to suggest the Magpies can save themselves. "John Carver's side are in freefall after losing their last seven games and to stay up they might have to rely on three of the six teams below them failing to catch them." Read more of Savage's relegation thoughts here. Leicester come forward again and Riyad Mahrez crosses to Leonardo Ulloa, but his header is straight at Tim Krul. Fantastic start at the King Power Stadium. As I say that Ayoze Perez has Newcastle's first chance. Daryl Janmaat charges forward and plays in the Spaniard, who gets free of Jeff Schlupp but he fires wide of the far post. Marc Albrighton plays a long ball forward which Leonard Ulloa chests down but he was just offside. But only just. Newcastle haven't responded yet at all. Former Republic of Ireland midfielder Kevin Kilbane: "Looking at Newcastle you thought they were home and dry prior to the losing run of their last seven games. "Now all of a sudden they lose the derby against Sunderland and looked really poor. They did not lift their performance for that match, it was flat and there was no energy in the side. You fear for them in the position they are in." Liz from South Shields: It's embarrassing to be a Newcastle fan. Breaks me heart what's going on at our club." You can also text us on 81111 in the UK only and remember to state where you come from. I should point out Liz actually texted this in before that goal! That goal took 38 seconds to score! The fifth fastest Premier League goal of the season. "If ever you could buy a start to a game then Leicester have done that. They got on the front foot, pressed the ball quickly, turned it over, got a corner and from that got themselves in front. That is a big goal, how Newcastle react will be interesting." Oh Newcastle. Marc Albrighton puts in the corner and Leonardo Ulloa loses his marker to head home past Tim Krul. A disastrous start doesn't even cover this. Fifteen seconds in and Leicester have a corner, which Jeff Schlupp wins. Newcastle get us under way in this huge relegation clash. Today is the last day of Papiss Cisse's seven-game ban for spitting. Still no space in the team for striker Facundo Ferreyra, who has not played a single minute of first-team football during his loan spell Shakhtar Donetsk. Newcastle fans hold up A4 pieces of white paper as the players come out. Very continental. The Tyneside faithful are not happy. Players come out of the tunnel. A potentially huge game in the relegation mix. Newcastle start today five points clear of 18th-placed Sunderland. Leicester are only one point above the bottom three. "We are staying up," chant at least one set of supporters. "I don't think Leicester's confidence will have been dented by their defeat by Chelsea on Wednesday night, and it will help knowing they have this game up next. "Some of Newcastle's performances have been atrocious and I don't see how their form is going to improve on Saturday. "Leicester are on 30 points and I think they are only two wins away from guaranteeing safety. "They might not even need that to stay up, but this is certainly a good opportunity for the Foxes to get one of those victories." Sam Lockwood: Newcastle need a win today. A draw isn't good enough today and hopefully the lads know this. Nervous is an understatement. "This is a game with a lot more riding on it than we might have expected just a few weeks back. "A month ago, Leicester were rock bottom and seven points from safety, while Newcastle were 12th and 10 points clear of the bottom three. How moods and perceptions have changed during April. "The Foxes' impressive run of 12 points from the last 15 has lifted them above the trap door and given them a realistic chance of staying up, while the Toon's gap to the bottom three has halved to just five points. It's an alarming slide that has seen them fail to collect a single point since beating Aston Villa 1-0 at the end of February." Newcastle United's form is obviously woeful but their previous in matches with Leicester is decent. The Magpies have won five and lost none of the last nine league matches with the Foxes (although Nigel Pearson's side did beat them in the FA Cup in January). Leicester City make three changes from the team who lost 3-1 to Chelsea on Wednesday. Matty James, Riyad Mahrez and Jeff Schlupp - who returns from a calf problem - come in for Paul Konchesky, Danny Drinkwater and Andy King. Newcastle United boss John Carver drops two members of the line-up that lost 3-2 to Swansea on Saturday. Vurnon Anita and Remy Cabella both drop to the bench as Moussa Sissoko returns from suspension and Paul Dummett is back from a knee problem. Leicester City: Schmeichel, Wasilewski, Huth, Morgan, Albrighton, Cambiasso, James, Mahrez, Schlupp, Ulloa, Vardy. Subs: Schwarzer, De Laet, Konchesky, Drinkwater, Hammond, Wood, Kramaric. Newcastle United: Krul, Janmaat, Coloccini, Williamson, Dummett, Gutierrez, R Taylor, Colback, Sissoko, Riviere, Perez. Subs: Woodman, Abeid, Anita, Ameobi, Cabella, De Jong, Armstrong. The rival managers - John Carver and Nigel Pearson - were having a friendly chat in the tunnel before kick-off. Perhaps discussing which of them is more desperate for a win today. Carver seemed to think he was standing on a Newcastle Metro tram as he holds onto the railing. "ostrich", "stupid" and "daft" during a bizarre post-match news conference. "cup of tea" after a heated exchange. The pressure is starting to show at the bottom of the Premier League.